National Ladies Shooting Day will be held on 11th June 2016. Shooting Events exclusively for women will take place all over the country on this day, many of them are already completely sold out! National Ladies Shooting Day caters for women of all ages, backgrounds and abilities, even if you have no gun experience whatsoever you are welcome to join in. NLSD is the ideal way to be introduced to shooting in a safe and social way. 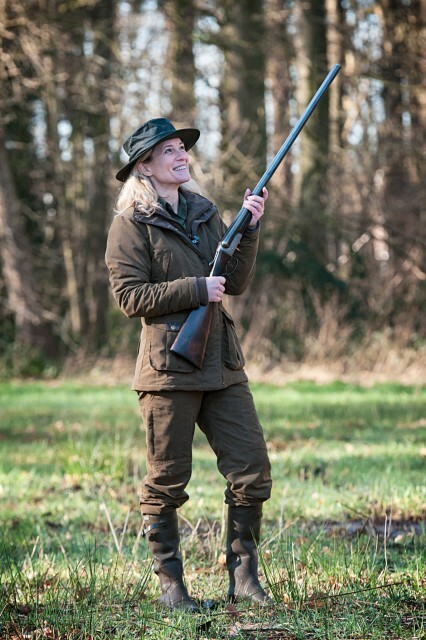 If you have tickets booked, The Country Catalogue can offer you a range of clothing and accessories perfect for National Ladies Shooting Day. Hoggs of Fife Alba Ladies Jersey-Lined Country Shirt SALE: Hoggs of Fife Alba Ladies Shirt is a beautifully made country cream and berry checked shirt in brushed poly/cotton with cosy jersey lining. With its sculpted hem, this semi-fitted ladies shirt is perfect worn tucked in or left out. It is also in the sale at a bargain price of £18.00! Toggi Chilton Ladies Tattersall Shirt: The Toggi Chilton is a semi fitted cotton shirt with stretch, featuring a pretty yet traditional tattersall check that is perfect for that country chic look! Hoggs of Fife Bonnie Ladies Cotton Shirt: A ladies long sleeved country striped shirt in 100% brushed cotton. The smart contrast floral trim to the inside collar and cuffs make this desirable for both town and country wear. Hoggs of Fife Bella Ladies Floral Shirt: The Bella from Hoggs of Fife is a long sleeved ladies shirt in 100% brushed cotton. A pretty pink and lavender floral print, combined with contrasting lavender trims and coloured buttons create a beautifully feminine country shirt. Hoggs of Fife Caledonia Tweed Cartridge Style Handbag: This gorgeous Caledonia Tweed bag from Hoggs of Fife is both a cartridge bag and handbag. Perfectly practical, this cartridge style bag features 5 cartridge slots and plenty of room for more cartridges, whilst the DWR coating ensures that your bag is rain and stain resistant. The Country Catalogue has a range of beautiful luxury cotton lawn and silk twill scarves that would be perfect for adding a touch of the countryside to your NLSD outfit. The scarves depict the paintings of a very talented artist in Scotland and please note, that if you purchase a scarf from this range it will be dispatched directly from our supplier. Cotton scarves are £35.00, but if you're looking to blow the budget Silk Twill scarves are £75.00. Luxury Cotton Scarf range includes designs: Pheasant in White, Pheasant in Grey, Duck in White, Duck in Green, Stag in White, Stag in Grey, Squirrel in White and Squirrel in Grey. Luxury Silk Twill Scarf range includes designs: Duck in White, Duck in Green, Pheasant in White, Pheasant in Grey, Stag in Grey, Stag in White. For a cheaper alternative, consider The Country Catalogue Print Scarf range available in Stag (Maroon), Pheasant (Turquoise) or Fox (Blue) design. Each of these scarves are ideal for the summertime because they are lightweight and made of 100% polyester. Not forgetting they are exceptionally on trend! Baleno Sally Fleece: is a lightweight, breathable ladies fleece waistcoat. A versatile fleece gilet with a feminine, flattering fit which can be worn independently or under a country or shooting jacket. The soft touch, strong sherpa fleece fabric is breathable and noiseless; ideal for shooting, hunting, beating and other outdoor pursuits. Finishing touches include a smart alcantara trim, a full zip, and zipped pockets. Musto Women's Melford Fleece Gilet: Features included a full zip to the neck to keep the chill out and two front zipped pockets. The synthetic suede trim creates a stylish finish to gilet which is machine washable 30°C. Available from The Country Catalogue Dark Moss. Hoggs of Fife Caledonia Ladies Tweed Waistcoat: The Caledonia Ladies Tweed Waistcoat is a classic shooting waistcoat tailored to a flattering ladies design. Bespoke tweed fabric commissioned by Hoggs of Fife: 60% wool for warmth and 40% mixed fibres for durability, with Teflon treatment for extra rain and stain resistance. Hoggs of Fife Perth Crushable Felt Hat: A stylish and comfortable country hat perfect for the outdoors. Made from 100% crushable wool felt with a wide brim, when packed with luggage the hat will spring back to shape. Water repellent finished with a leather band. Hoggs of Fife Caledonia Ladies Baseball Cap: Hoggs of Fife Caledonia Ladies Baseball Cap is one of the accessories made in this top quality tweed. This smart cap is in a mix 60% Wool for warmth and 40% mixed fibres for durability. Teflon coated for rain and stain resistance this 6 panel cap also has an adjustable rear band for a comfortable fit. Finished with a green moleskin. Seeland Exeter Advantage Ladies Trousers: Seeland Exeter Advantage Lady Trousers are perfect waterproof outdoor trousers for shooting, beating, picking-up or general outdoor activities. Hardwearing and with a SEETEX® membrane, they are also windproof and breathable. They are fully lined, include thigh pockets with zips and adjustable leg hem.